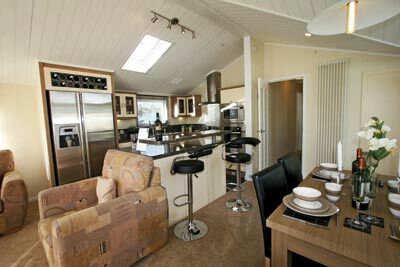 Whether you want to entertain guests in your holiday lodge or simply like the feeling of spaciousness then the luxury Atlas Laburnum lodge is a worthy lodge contender. It’s a home with an open plan design and a simple, uncluttered look. The Laburnum’s wow factor continues with handcrafted wooden furniture, the use of natural minerals and ample storage space. The Shaker style design that is carried throughout the lodge originates from the late 18th century/early 19th century by American religious communities known as the Shakers. It’s based on the idea of simplicity and that every object should have a function. The lounge area – which you can enter via French doors or via the dining area from a side door in the side elevation – gets a vaulted ceiling, contemporary three-piece suite, wall-mounted driftwood-effect fire, modern display cabinet with hi-fi point linking to ceiling mounted speakers in the living area and bedrooms and wiring to accommodate a flat screen TV in the lounge and main bedroom. Natural light comes flooding in through the aforementioned French doors and a full-length window in the front elevation. This light adds to the feeling of spaciousness in an already roomy environment. A dual height breakfast bar sits between the kitchen and dining area and includes two black and chrome height stools. The high-spec kitchen offers a large US-style fridge freezer (with ice maker) and integrated 12-place dishwasher. It’s equipped with cream, wall and floor-mounted cupboards with chrome handles and glossy black worktops. The five-burner hob is a perfect arrangement for the passionate cooks among you and there’s a wok burner too so you can really show off your culinary skills. An integrated high level oven and separate microwave are icing on the proverbial cake. And while on the theme of food, this will be served in the dining area that gets an elm table and four chairs, a column-style radiator and the door to the boiler cupboard (it’s an A grade Combi gas boiler by the way). The master bedroom is spacious with an en suite bathroom and separate shower. 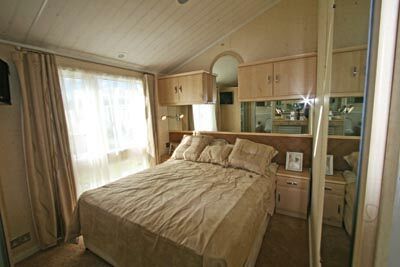 Its double bed is 5ft wide by 6ft 3in long and mirrors and cupboards sit above its faux suede headboard. As well as a dressing table, it also has a mirror-fronted generous-sized wardrobe with six drawers and some shelves. The en suite gets wall-to-wall mirrors, two integrated cabinets and a domestic style bath. There’s a shower, loo and basin plus ceiling-mounted extractor fan and a window by the bath. The twin bedroom has two 3ft wide x 6ft 3in long beds (a double bed can be ordered as an option), a twin-door wardrobe and a free-standing bedside table. There’s a second shower room next door comprising toilet with a soft close seat, a 900c corner shower and a pedestal basin with pillar taps. 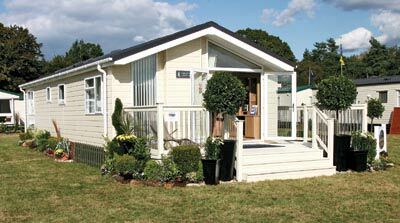 A luxury lodge that is bright and breezy with a good range of specification. The downside is lack of utility room but a washer/dryer can be ordered as an option for some models. 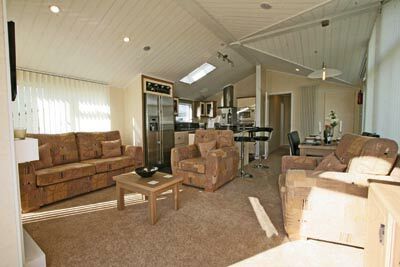 I would like to get a price information about the complete furnished Laburnum Lodge Size 40ft x 16 ft. I live in Holland and I also would like to know the export costs. If you visit the Altas website, you’ll find information on how to contact the manufacturer direct about prices and export http://www.atlas-caravans.co.uk/contact_us.cfm.